"I'm raising money so that other children get the chance to play sports..."
George Daly is not your average 9 year old! A huge Liverpool FC fan from Widnes, George has decided to run the upcoming Liverpool 1k Kids Marathon on Saturday 5th May at Sefton Park, in aid of the LFC Foundation. George loves to help others, enjoys playing football for his school team and plays rugby every week for local side Halton Farnworth Hornets! "I'm raising money for the LFC foundation so that other children get the chance to play sports and improve their skills". George is determined to beat the time he ran in last years run, when at 8 years of age he raised £100 for Oddballs, an underwear company that aim's to raise the awareness of testicular cancer. 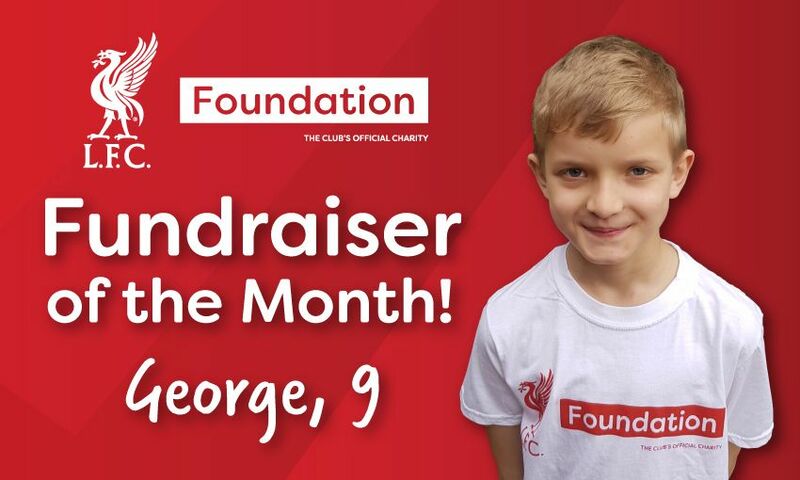 This is also why the LFC Foundation have named George as the first ever LFC Foundation Fundraiser of the Month! How can I nominate for 'LFC Foundation Fundraiser of the Month'? If you know someone who is fundraising for the LFC Foundation and think they deserve this award, you can email our friendly team at lfcfoundation@liverpoolfc.com. Every month our team will then pick the winner and share our Fundraiser of the Month story across the LFC Family!